Evoking the sea and skies with a few perfect clouds, a blue-and-white palette brings comfort and style that’s cool, calm, and collected. Get inspired by this roundup of our favorite rooms decorated with this timeless color combination. Soothing gray-sage walls let white woodwork and blue accessories take center stage in this vacation home just minutes from the beach. Turquoise blue glassware in the dining room cabinets echoes the blues in a painting called Pool at Noon which hangs nearby. Silvery blue slipcovers partner with beige ones in a visual symphony inspired by water and sand. A family room is elegantly appointed in ivory and navy blues in this bachelor pad remodel. Creamy linen drapery panels are edged in blue grosgrain ribbon to emphasize the hues of the Ralph Lauren and Brunschwig & Fils fabrics. "My whole life has been about blue and white," designer Jack Fhillips explains. "We live in blue jeans, white button-downs, and navy jackets. The look is American classic, and it translates from fashion to interiors so successfully." A built-in bookcase in the family room features natural raffia inserts affixed to the wall. The raffia’s neutral hue lets the indigo and silver mementoes pop, while giving the area a lovely textural background. A white kitchen boasts blue accents and country themes. Antique Chinese Cantonware and blue-and-white transferware pop against the kitchen’s neutral canvas. Intricate moldings help tie the room to the home’s 1936 origin. Pretty cobalt, royal, and French blues drench furniture, fabrics, and walls in this updated suite of rooms near the river. The only color addition is in the French Country kitchen, where spirited yellow accents add a feeling of sunshine. A blue-and-white tile backsplash eases the transition between kitchen and living room, where crystal lamps illuminate the same palette. See more of this home on the following slides. 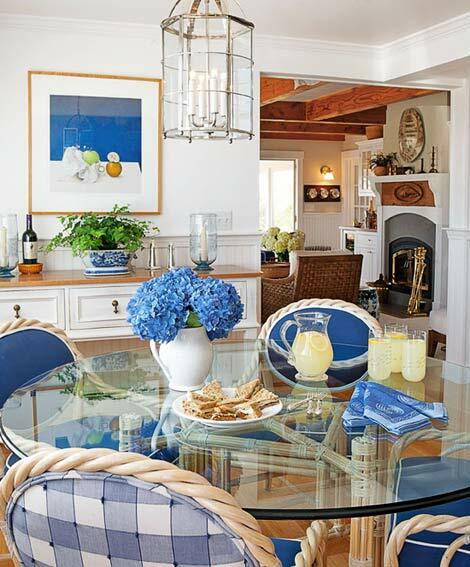 Lively patterns in shades of blue play against a crisp white backdrop in this casual dining area. A window seat is piled with pillows from Schumacher, a comfy spot for conversation. A valence over the windows is trimmed in navy blue for a smart complement to the mix of patterns below. The guest bedroom of this waterfront home reflects the landscape outside while incorporating some more formal elements, like the regal brass chandelier and checkered canopy that adds height to the tufted white headboard. The pillows and duvet are covered in a pretty blue-and-white damask print. See the rest of this waterfront home here. A master bedroom with an open sitting area calls for a soothing palette of cream and blue. The bench at the foot of the bed, covered in “Caterpillar” from Schumacher, lends a dose of texture and rich chocolate brown details to complement the powder blues elsewhere. Gauzy ivory drapery at the windows feature layers of aqua beneath, tying the room’s palette together. Take a look at the rest of this home here. A summer home on Nantucket Island boasts a classic coastal color scheme. In the living room, knotty pine ceilings warm the crisp navy hues of the sofas and pillows. 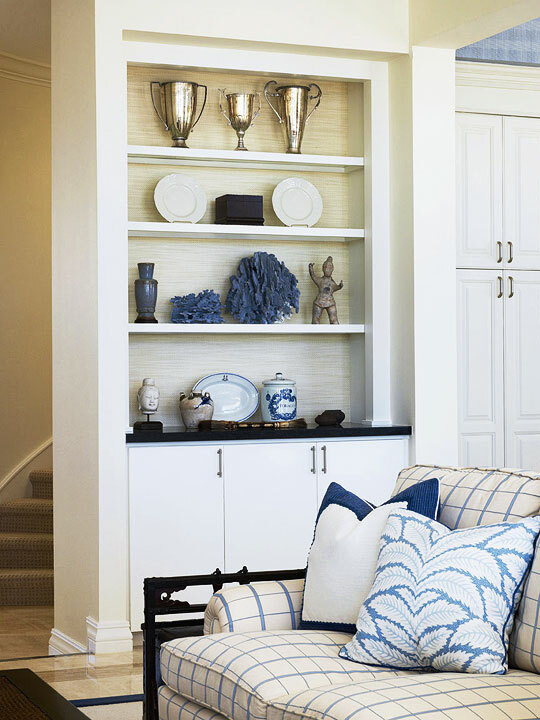 “We wanted a casual beach look so we could come in with sand on our shoes or sit on the living room sofa with a wet bathing suit and not worry about it,” says homeowner and designer Trudy Dujardin. See more from this summer home on the following slides. Chairs from McGuire are upholstered in blue-and-white gingham fabric to anchor the dining room. Crisp white walls are dotted with blue accents, like the artwork by Rose Gonnella and the linens on the glass-topped dining table. Teak furniture on the screened porch is covered in durable blue fabrics from Sunbrella. The Nantucket look is completed with seaside memorabilia, a vintage lantern, and worn wood shingles. In the master bedroom, the coastal hues are lightened up to an ethereal palette of soft blues and airy whites, reminiscent of the sea glass found on the beaches outside. The palette is accented with sandy golds to warm the space. See the rest of the Dujardins’ summer home here. Americana rules in this lakeside home accented with weathervanes, antique quilts, and blue-and-white china. But it is clearly the latter that inspired the choice of cheery cobalt-and-white Lee Jofa fabric for Hickory Chair armchairs and a sky-blue Stark rug in this sitting area by the kitchen. White-painted vertical wood planks and a beaded-board ceiling painted gray-blue make a soothing backdrop for the patterned furnishings. An arresting blue-and-white toile print from Duralee frames the sleeping niche in this bedroom, designed by Mary Douglas Drysdale. The lively fabric covers the bed cover and curtains, as well extending to the wall covering. Classic gold wall sconces and rich woods keep the space feeling cozy and welcoming. See the rest of this Capitol Hill renovation here. Dressing the master bedroom in her favorite Swedish color palette made sense for this homeowner because the ocean is just across the street. 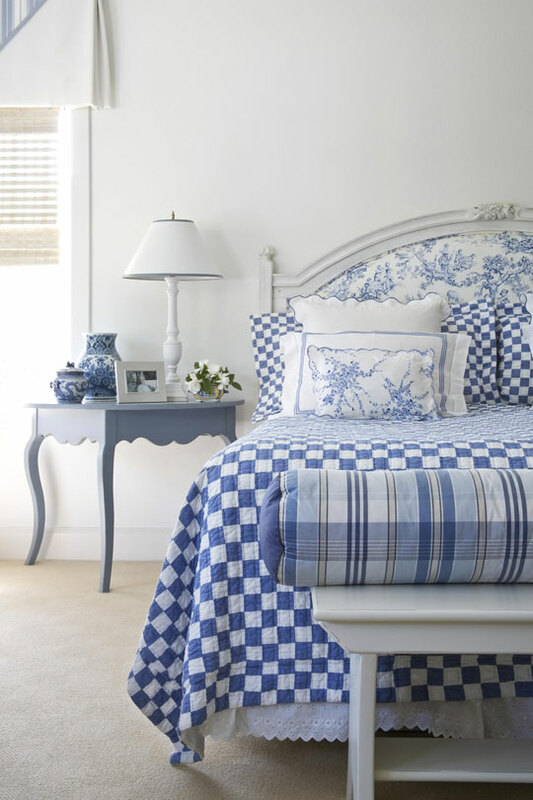 By paying attention to scale, shade, and proportions, she was able to mix four patterns in varying shades of blue and white on the bed and bench. Light, painted furniture goes hand in hand with the casual, low-maintenance textiles. 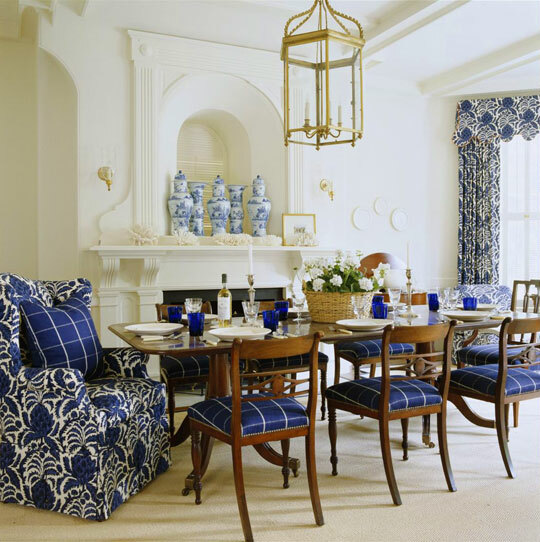 Large enough to take on the energy of a gutsy pattern, this dining room boasts dramatic indigo-and-white linen for a pair of wing chairs on either end of the table and at the window bay. Grouped into a dramatic niche above the fire place are five oversize blue-and-white 19th-century Chinese export porcelain jars. See next slide for another view of this room. Indigo-and-white linen dominates the dining room’s seating area on two club chairs, an ottoman and sofa, and in stately draperies richly gathered into side panels and topped by a scalloped valance. Throw pillows in Tattersall check match the dining room side chairs, tying the two spaces together. Blues in this breakfast room range from the deep navy lacquer of the Windsor chairs to the light denim of the valence above. The ivory banquette is adorned with pillows embellished with delicate blue accents, resembling the colors of the china at the table. A drum pendant shade above brings in a dose of animal print, while tangerine placements provide a pop of color. Contemporary architectural elements in this master bedroom are softened by the spa-like palette of wheat and indigo. A loose-patterned De Gournay wallpaper behind the bed keeps the mood casual. Designer Lisa Sternfeld transformed this entryway walk-through into a special sitting area bedecked in icy blues and silver. The antique dining chairs are gilded in white gold for opulent shine. The living room captures the essence of the glamorous seaside home with a barely-there blue on the lofty walls and a natural sisal rug grounding the space. A silk-velvet Irish sofa is covered in a luxurious blue, a concentrated version of the walls surrounding it. In the dining room, antique pieces are covered in modern fabrics rich in texture. Mirrors flanking the mantel are made of thick, chiseled glass to (literally) reflect the room’s icy palette. Indigo tie-dyed fabrics in the sitting room give an air of casual elegance and nod to the mid-century. Explore the rest of this second home here. The coastal palette in this summer home is given a youthful twist in the master bath, where periwinkle tiles from Urban Archaeology and a custom vanity built by Waterworks. Veined marble floor tiles lend elegant interest to the floors; glass doors and twin mirrors keep the natural light flowing. 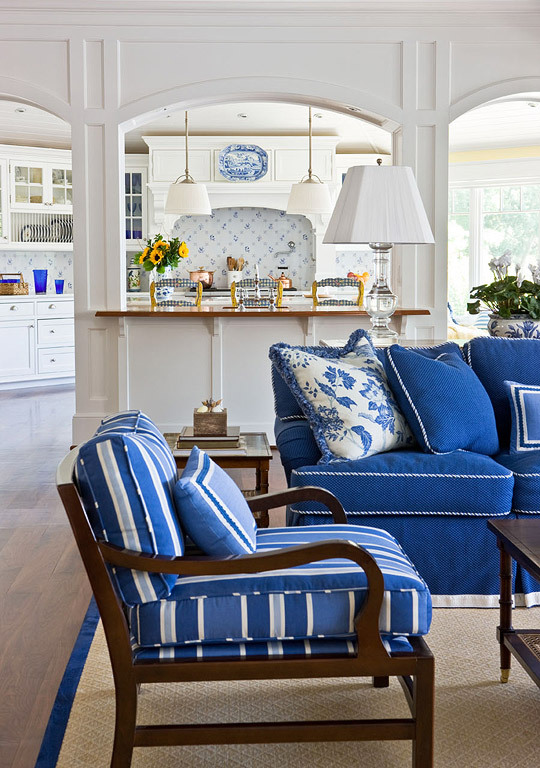 Combining navy, bright blue, and white leads to a sophisticated retreat as seen in this refreshing sunroom that mirrors the colors of nearby Nantucket Sound. Furnishings were left casual, but updated with hard-wearing outdoor fabric for durability. Woven shades, rattan furniture, and a sisal rug add their own natural spin to the water-inspired room. The Swedish antiques that fill it inspire this charming master bedroom, which is wrapped in a serene palette of airy blues and whites. An antique ivory-painted mirror and chest are set between new Marvin windows. The custom area rug from Stark ties the room’s accent colors together with the complementary neutrals. A classic seaside palette gets an unexpected upgrade with stylish British Colonial design elements, like English-style armchairs with French-blue paisley cushions and oatmeal-colored raffia upholstery. A leopard-print rug adds an unexpected element of modernity. See more of this beach house on the following slides. Designer Barclay Butera describes this home’s aesthetic as “beach house with a twist,” which is evident in the dining room. Preppy stripes on the dining chairs contrast with more traditional furnishings, like the blue-on-white wallpaper and elegant oval dining table. Even the chandelier represents Barclay’s unique mix of styles, with navy blue shades over the unique seashell design. The bedroom’s palette is a sophisticated mix of patterns and textures in varying shades of blue. A paisley wallpaper from England softens the dark mahogany of the four-poster bed and chest. See the rest of this fabulous beach home here. Adjoined to the kitchen, this breakfast room is a cool departure from the yellow-and-white scheme of the surrounding spaces. Its casually classic aesthetic is exemplified with blue-and-white toile on the walls and buffalo plaid at the windows. Around the table, chairs are cushioned with a playful fabric in blue. A painted yellow corner cabinet eases the transition from the kitchen while housing a collection of blue-and-white ceramics. 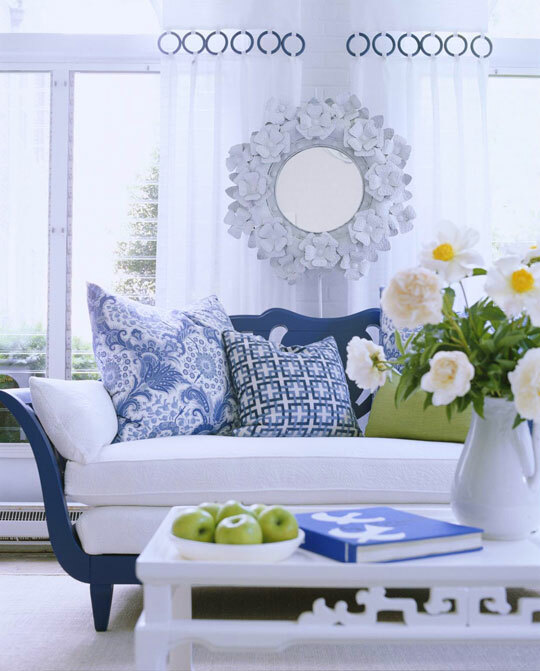 Textures, shades, and tints reign in this blue-and-white solarium highlighted by a cobalt-painted wood chaise with white matelassé cushions. Throw pillows add different shades and patterns of blue to the mix, while a white Chinoiserie coffee table and hammered metal appeal to the sense of touch. This guest room’s blue-and-white palette is freshened with subtle mint and sea-foam tones. Draperies are made with a hand-blocked fabric from TylerGraphic. See the rest of this vacation home here. The entryway into designer Julia Wong’s sky-high apartment for the Ritz-Carlton Showcase in Chicago makes a bold first impression. A large painting by Bradford Stewart hangs at the end of the narrow entry, packing a punch of color against the hallway’s crisp white walls. Tour the rest of her stunning showcase apartment here. Powder blues and soft greens create a serene environment in this guest bedroom. Complementing the cooler tones are neutrals punctuated with pink. Centered against the far wall is the custom tufted bed, made up with luxurious cream linens from Frette. See the rest of Skip’s home here. Striped wallpaper from Ralph Lauren Home provides a handsome background in this dining room. Shapely Queen Anne chairs are upholstered in ivory linen with contrasting brown piping for a touch of complementary variation in the room’s clean palette. Rich royal blues are tempered with natural woods and a neutral wall paint from Benjamin Moore. A striking indigo metalassé covers the bench at the foot of the four-poster and an armchair beside the window. Tour the rest of this Florida bachelor pad here. Classically appointed in cool blues and crisp whites, this living room’s palette is softened with nature-inspired neutrals and rich textures. An antique sofa has been recovered in a fresh white cotton duck for a modern look. A column of framed botanicals lends verticality. The sisal rug underfoot grounds the airy tones of the walls and furniture. An heirloom rocking chair upholstered in ivory fabric is adorned with hand-painted family names in a dusty blue. The embroidered look of the script accompanies the historical impact of this personal piece, which is sure to last through the generations to come. See more of this home inspired by showhouse ideas. In a Welsh country home, blue-and-white cotton toile saturates this guest bedroom—from the upholstered walls and the drapery panels to the bed skirt, table skirt, and quilted cover of the eiderdown that tops the painted caned bed. See the rest of this beautiful home here. Snowy-white linens resting against a sky-blue headboard and dust ruffle turn this canopy bed into a restful sanctuary. Soothing beige walls suggest the sandy beach just a stone’s throw away from this lakefront home. 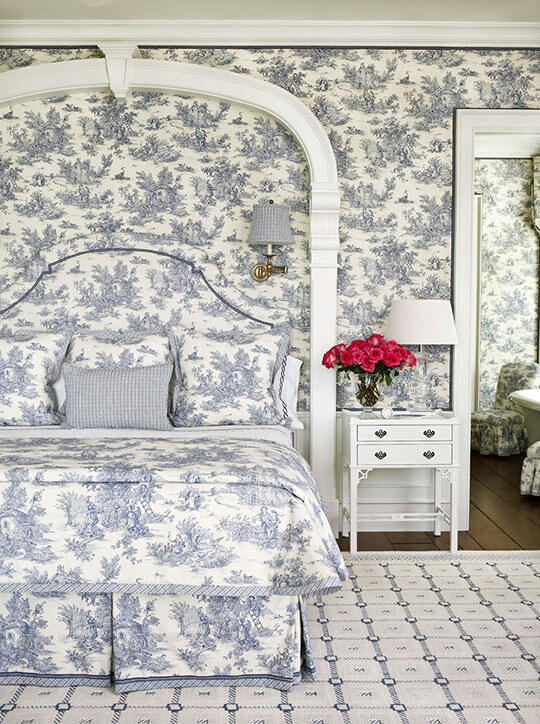 Feminine without being frilly, this blue-and-white master bedroom features lush toile fabric from Hinson and Company used for the wall covering, bedding, and furniture. Together with the blue-and-white needlework rug, the toile accents create a peaceful mood throughout the suite. White crown molding defines the space; an elegant white arch frames the bed and makes it a focal point. Calm is the order of the day in a living room whose Palladian Blue walls reflect a love of the hue. Thanks to a casual attitude, turquoise upholstery, blue accent pieces, and white-painted antique furniture mix easily with sunshine and such modern pieces as the glass cocktail table. This narrow but efficient bunk room was designed to accommodate visitors -- old or young -- who gravitate to the nautical address for vacation fun and relaxation. 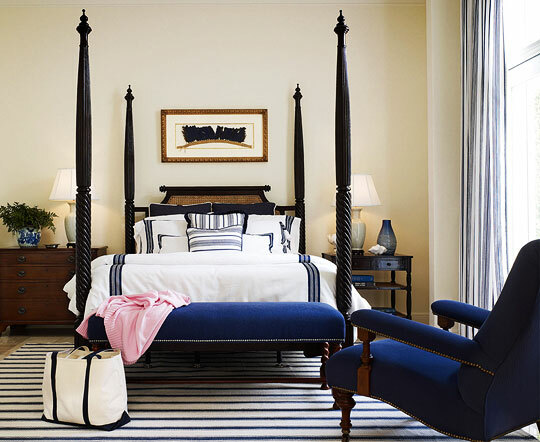 Bold navy-and-white stripes, informal fabrics, and cotton rugs give the room an energetic feel. In a kitchen both traditional and unexpected, graphic blue-and-white “The Vase” wallpaper from Clarence House adds cheerful energy to a compact space. Glass-front cabinet doors share a love of transparency with the Lucite bar stools at the center island. Stainless-steel appliances add subtle gleam without taking attention away from the glorious blues. Perched at water’s edge on beautiful San Francisco Bay, this house and its ocean-view family room offer breathtaking views of the Golden Gate Bridge and the Pacific. Fittingly, the casual room features a palette plucked from nature: sky and ocean blues in the shades of its upholstered and painted furniture. Craving more blue and white decorating ideas? Check out this home in coastal colors.